has ever asked to return to! 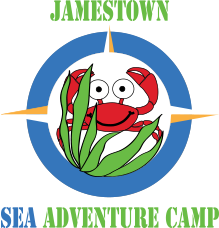 JAMESTOWN SEA ADVENTURE CAMPS OPENS FEBRUARY 15. NOTE: ARE YOU A JAMESTOWN RESIDENT? Jamestown resident children, relatives of Jamestown residents, those who live on a boat in Jamestown waters, and/or those who rent in Jamestown for any period of time, have registration priority over non-Jamestown residents until April 15. Anyone not in the above categories may register beginning April 16. If you are not in one of the above categories, and register before April 15, you will automatically be placed on a waiting list. Children ages 4-6 are invited to participate in this land-based marine ecology class from 9 am - 12 pm. Children will explore the Fort Getty marine environments - the rocky shore, the sandy beach, and the salt marsh. Children will discover and learn about marine animals and their habitats through hands-on activities. The goal of the class is for kids to have a positive experience at the water's edge, while learning more about the marine environment. Children must be able to communicate verbally and be fully toilet trained. Camp will run from 9 am -12 pm. All campers should bring a snack. No food will be provided, but a water refill station will be on-site so please bring a reusable water bottle. *NOTE: There is NO swim check for this age group. This is a land-based class. They may get their feet wet in the water, so you are welcome to bring a life jacket for your child/children. However, they will not be going swimming and thus, will not have a swim check. CAMP IS NOW FULL If you wish to be added to a full camp waiting list, contact Meg by e-mail or 401-855-6643. Site by: J.E.G. Design, Inc.